As one of the most decorated and awarded singers and musicians in the world, Carlos Santana and his band Santana have won every major music award an artist can win, including 10 Grammys, 3 Latin Grammys, Billboard’s Lifetime Achievement Award and the Artist of the Century Award, a Star on the Hollywood Walk of Fame, an early induction into the Rock and Roll Hall of Fame, and Kennedy Center Honors. Carlos has been the visionary force behind artistry that transcends musical genres, generational, cultural and geographical boundaries. Santana has sold over 100 million albums worldwide and 100 million tickets to his concerts. Still current, producing and playing the CBS theme song for this year’s Super Bowl broadcast, Carlos Santana is considered one of the top five guitarists of all time! With his music and style one of the hardest to replicate, tribute shows have been non-existent…until now! Delivered with a level of passion and soul equal to the legendary singer-guitarist, Madrigal, The Ultimate Carlos Santana Experience, pays tribute to an artist and band that has transcended five decades of chart-topping success and developed one of the largest die-hard fan bases in the world. With such a tough act to follow, Madrigal has pulled out all the stops. 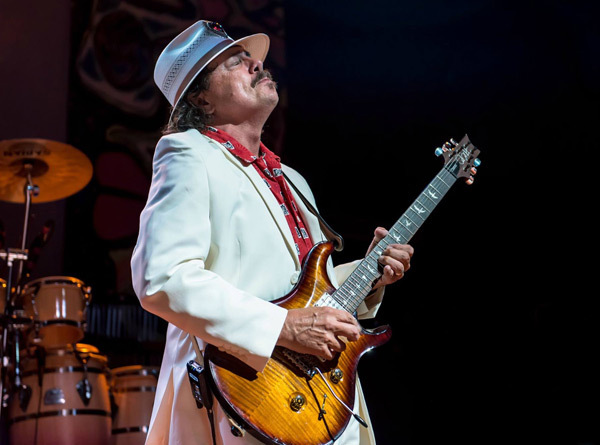 Their sincere devotion to replicating the musicianship, sound and full Santana concert experience, is filling venues and rocking people’s socks off! Madrigal’s attention to that signature blend of Latin-infused rock, jazz, blues, salsa, African rhythms, and the sonic charge of Santana’s guitar has led to sold out concerts. The band’s frontman, renowned guitarist Jose Madrigal, is often mistaken for Carlos himself. The experience doesn’t stop there. Madrigal, The Ultimate Carlos Santana Experience is a complete festive package. Creating one of the world’s best-known musical signatures, Madrigal has over a half dozen professional musicians and vocalists that more than complete a show for the senses, each with their own distinctive talent. Every show provides a unique and high energy live music experience, featuring melodic blues-based guitar lines set against Latin percussion of timbales and congas, always leaving audiences wanting more!